Ask the Experts: What Options Do I Have for My Autumn Wedding Bouquet? Autumn has given us a generous gift, a reward for our toil, a ripe harvest to gather. As a florist and designer this season will literally take your breath away, the richness of colours available, the fusion of fruit, flowers, seeds and foliage make this the most exciting time of year in any flower shop. Flowers will bring the Church, Country House, Barn, wherever you choose ‘to tie the knot’ to life. If you could see what I have seen so often, the “before we’ve come” and “after we’ve left” effect the flowers have made to the room, you would need no more convincing. Let’s talk Autumn. The colours for 2016-2017 are complex, they are deep and moody like a rich glass of burgundy. 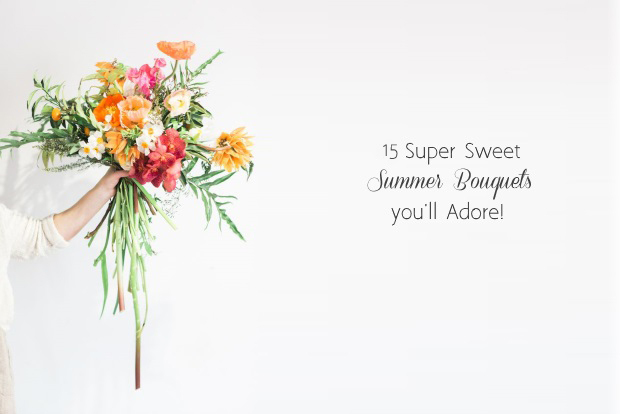 Vintage and bohemian styles have blended, bouquets have become bigger, the shape is loose – it’s the ‘just picked or foraged from the garden look’, difficult to get right if you don’t know what you are doing, incorporating heirloom blooms, rich coloured roses, berries and mixed foliage. The mood is that of Vermeer, the Dutch Old Master. The palette is shades of blue and gold, muted reds and greens, it’s sophisticated. We will see a lot of garlands and crowns, tables decorated with bounty. Succulents are still very much a part of this season. Flowers available in Autumn include Amaranthus with its long hanging tendrils, Gloriosa, Protea from South Africa, seed heads like Papayer. Roses are so wonderful now with David Austin varieties and some old favourites like black Baccara and Grey Knight. Hydrangea and Celosia add a touch of velvet to a bouquet. Anemones are here again with their paper-like petals and vibrant hues. Autumn has always been a traditional time of year for weddings and with good reason. With such bounty celebrations were centered around the harvests when there was plenty to celebrate, the mantra was “eat, drink and be merry”. Autumn is a beautiful season full of change. The colours of flowers and foliage become more rustic as the season progresses. 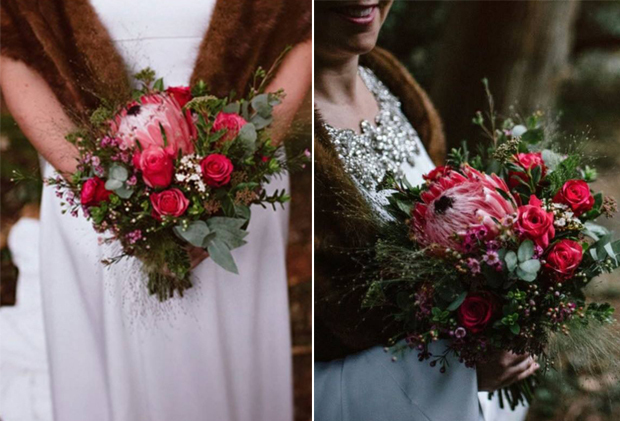 Autumn wedding flowers bring to mind rich, warm colour tones and lots of wonderful textures. Flowers such as Asclepia, Celosia, Protea, Carthamus, Gloriosa, Achillea will provide the traditional Autumn colours of orange, red and yellow to your bouquet. Add a fiery orange rose like ‘Naranja’ or a two-toned orange and yellow rose like ‘Marie Claire’ and you’ll have a show-stopping bouquet! Shades of burgundy, rich reds, deep pinks and purples are also a fabulous Autumn colour palette. Seasonal flowers like Callas, Dahlias, Hydrangeas, Asltromeria and Amaranthus work really well, especially when combined with the softer pink and peach colours of Waxflower, Astilbe and Hypericum Berries to provide contrast. ‘Avalanche’ roses are a superb wedding rose that add a real touch of luxury to your wedding flowers and are available in pastel shades of peach, pink and cream. Whatever your preferred colour scheme, seasonal grasses, poppy seed heads, willow and berries will enhance the Autumnal feel and add texture and interest to your flowers. And if you’d really like to have some fun with your Autumn wedding flowers, why not incorporate some miniature pumpkins into your table décor, you could even spray them silver or gold if you’d like to add a little sparkle! Every season has its own magical feel to it. The freshness in Spring, cool and cosy in winter and bright and colourful in Summer. Autumn brings with it crisp air and falling leaves and we are captivated by the beautiful earthy tones of Mother Nature. 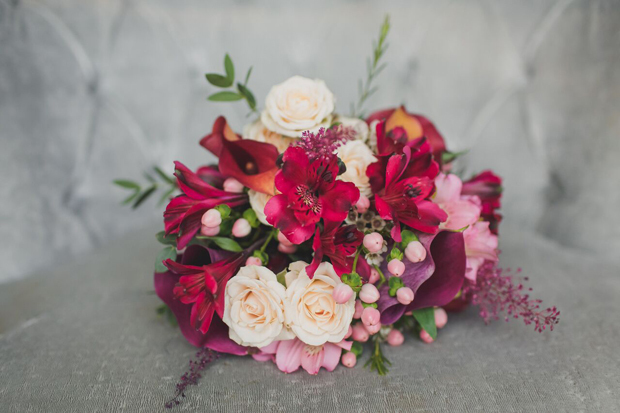 Rich reds, pinks and deep orange tones in both flowers and foliage inspire many wedding bouquets at this time of year. 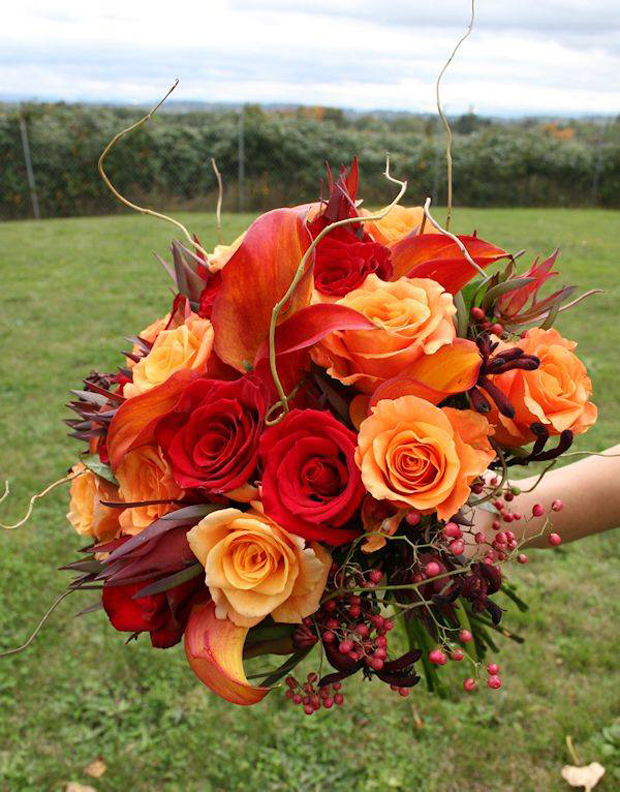 Autumn wedding bouquets are often rich in texture and color. Think tones of gold, yellow, oranges, peaches, reds and browns. In saying this, Autumn bouquets don’t always have to follow the traditional palette, adding a surprise splash of pink to your deep reds or burnt oranges can work beautifully. Soft peaches and ivories with hints of gold tones can also look beautiful at this time of year. Seasonal flowers include Roses, Gerberas, Calla Lilies, Cymbidium Orchids, Freesia, Chrysanthemums and berries.